On Saturday, we caught up with Onward, etc. at the Mountain View stop of the 2015 Warped Tour. 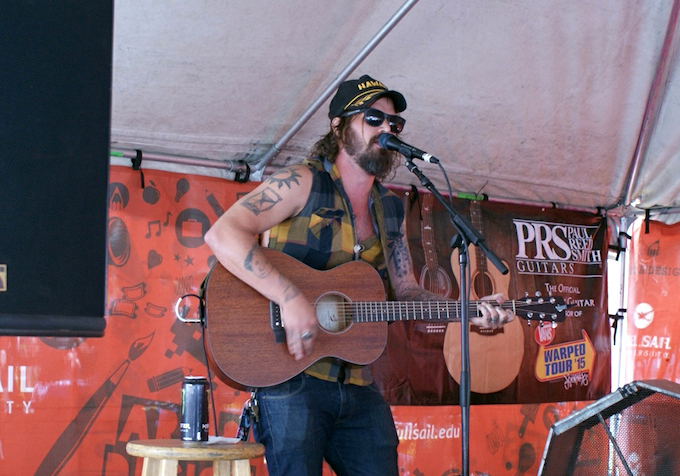 Rosco Wuestewald, the mastermind behind the raucous folk project, played a solo acoustic set at the Acoustic Basement Stage. Even though Warped Tour is mostly known for its big-stage rock offerings, he cumulated quite the crowd with his rowdy live show. After the set, we sat down with Wuestewald to talk about his music and his experience at Warped Tour. You are playing at the Acoustic Basement stage this year. Do you prefer to play acoustic or with a full band and amps and everything? What are the advantages of acoustic set versus amplified sets? Rosco: I think it both has its ups and downs. I haven’t done a solo tour for about four years now so it’s nice to get back into that feel of playing acoustic for the audience. The crowd’s response is always different because our music with the full band is so rowdy and we get people moving really easily and with the acoustic it’s more just intimate. You almost feel closer to the crowd as when it’s not as big because you get that intimacy. Your music has developed a lot in the past years. From being a solo artist to teaming up with your band members, how has your music changed throughout the years? Rosco: I think it’s constantly evolving. I started off as a singer/songwriter and then looked more into the production of creating music as a band and now it’s kind of falling back into a singer/songwriter, so yeah I think it’s going to constantly be evolving depending on the tour and where we’re playing, what we’re doing. You’ve been traveling a lot, playing with many different musicians and networking in general. Tell us a little bit more about the project Onward, etc. and the artist collective that you formed. Rosco: It was a lot more like an artist collective a few years ago after some of the tours got a little bigger, we kind of had to buckle down and get some permanent members and then bring on other people as well but yeah it’s pretty much just different regions of the country and different guest musicians that will come out. We’re friends with the guys from Flogging Molly, Skinny Lister, Larry and his Flask. Every time we’re in their area, they’ll jump on stage with us and vice versa, so it’s always evolving. Is this your first year at Warped Tour? What’s your impression so far? Rosco: One and a half. I did a short little run in 2012. Has Warped Tour changed in your opinion? Rosco: Yeah, for sure. It’s a beautiful experience when you’re younger but it’s a different experience now. So many different acts, so much to see…I feel like people used to go to Warped Tour to see the bands that they knew were gonna be there. I feel like now people go to Warped Tour to discover some of the bands that are actually not yet well known. I went when I was 14 and saw Snapcase, Pennywise, crazy classics. 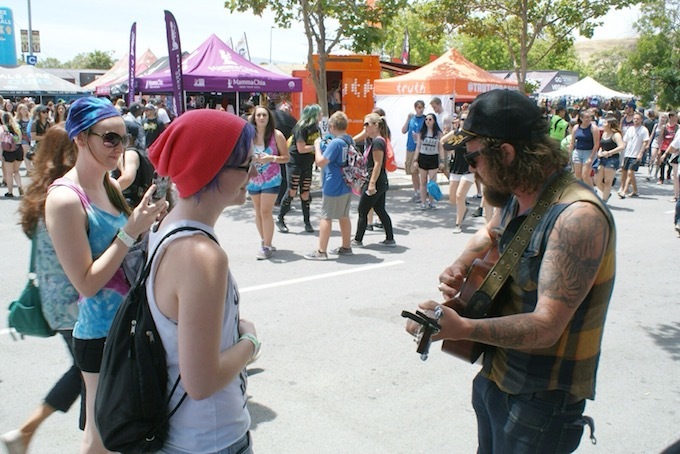 The Entertainment Institute is hosting different workshops at Warped Tour this year. Do you have any advice for musicians that are trying to make it in the business? Rosco: Buckle up! (laughs) If you’re trying to do it, just go for it. You just gotta learn to love the music. The money side is not really there anymore, you know. But if you want to do it go full force and there’s a chance that something might happen. But yeah, buckle up because it’s a wild, wild ride.